RIO DE JANEIRO, BRAZIL – Formerly an aristocratic neighborhood that became a commercial hub in the early 20th century, along with Flamengo’s expansion came the careless demolition of most of the neighborhood’s old colonial homes. Along the beach, Rio’s original, pre-Copacabana luxury apartments do, however, remain, whilst further inland the shady, palm-lined streets are home to occasional flourishes of art deco architecture. 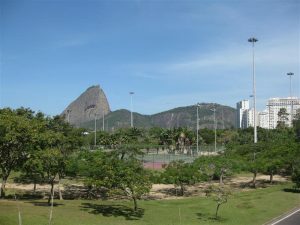 View on Sugarloaf Mountain from Flamengo Park, photo by Milli Legrain. Anyone looking for a more affordable square meter than those in Copacabana or Ipanema would do well to add Flamengo to their hit-list. Undoubtedly less fashionable but arguably more interesting than both, this small yet busy neighborhood with a local feel is conveniently located in the middle of Zona Sul and flanked by the beachfront Flamengo Park (also known as the Aterro) on one side and the traditional neighborhood of Laranjeiras on the other. Served by two Metrô stations, a healthy mix of young people, families and senior citizens gather along Ruas Marquês de Abrantes and Senador Vergueiro, the two main commercial drags running north to south. Lined with an impressive variety of restaurants, juice bars and botecos as well as fashion outlets like Havaianas and Oops, it offers all the amenities, a handful of classics like the Majorica steakhouse and Café Lamas, and even boasts two Chinese supermarkets. Upmarket apartments can be found on Avenida Oswaldo Cruz or overlooking the shaded Flamengo Park, conceived by Brazilian architect Lota de Macedo Soares (as told in the recent film “Reaching for the Moon”), designed by Burle Marx, and the biggest park in the city, thronging with life from dawn until dusk. 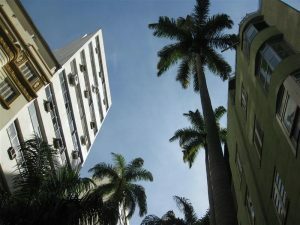 From the park to the Palácio Guanabara, Rua Paissandu holds some of the area’s most expensive square-meterage by virtue of the Imperial palm trees lining the road, by which the royal family had their once-glorious view to the bay framed. During the 2016 Olympics, the park will host athletics and road cycling events, but for the less energetic, the infamous, all-you-can-eat churrascaria meat palace Porcão Rio’s can be found just off main drag Avenida Infante Dom Henrique. The six-lane highway is closed on Sundays, and although the beach is not fit for swimming, the sands are clean and offer fantastic views of the Sugarloaf Mountain and across the bay to Niteroí. Palm tree lined Rua Paissandu, photo by Milli Legrain. All of which means the demand for housing is, understandably, very high and prices have rocketed for even the simplest of one-bedroom apartments. Word-of-mouth is the best way to start hunting, with local workers keeping a keen eye on what is available, often acting a unofficial agents. “An apartment in this building here was going for R$150,000 when I started eight years ago. Now it is worth R$800,000 or R$900,000,” said doorman Francisco Silva. One Flamengo resident had a simple explanation of the difficulties house-hunters have in the region; “It’s hard to find an apartment here because it´s a good neighborhood and nobody wants to leave,” she told The Rio Times. Prices in Flamengo currently stand at R$10,574 per square meter. A modest, two-bedroom apartment on Rua Paissandu starts at around R$1 million, and expect to pay another R$500,000 on the beach road. Larger, luxury apartments can easily fetch R$3 million, but a two-bed with no view can still be found for R$650,000. A four-bedroom apartment on Flamengo beach with two living rooms and a garage space can be rented for R$10,000, with rental values at R$46 per square meter.